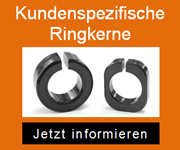 The innovative solution for power loss testing of ferrite cores by BLINZINGER. During the operation of inductive components like winding components power loss occurs - this power is being issued as heat to the environment. 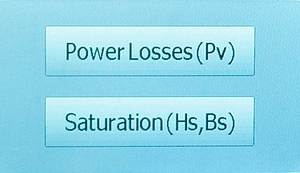 In this context ferrite cores cause power loss. The construction and quality of the materials used in ferrite cores significantly influences power loss of an inductance. As a reaction on the lively interest of our customers on this topic, BLINZINGER Elektronik wanted to develop a measurement device, which offers testing and showing fast results of the described power loss in just one device. With the new measuring device BVM20 we offer a perfect solution for precise power loss measuring of ferrite cores. 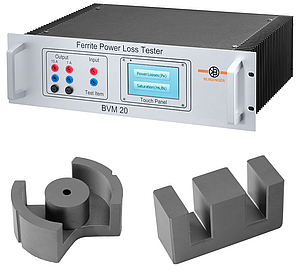 The BVM20 measurement device serves to register the core loss in ferrite cores under realistic conditions. To achieve this, sinusoidal voltages are put on the ferrite core to be tested. Voltage and current are measured. A power generator generates the sinusoidal test-voltage, which can be adjusted in 10mV steps up to 40V amplitude. The frequency range can be adjusted in 1 kHz steps from 1 kHz up to 254 kHz. The BVM20 is operated via touch panel. A fast 32-bit microcontroller handles the evaluation of the measurement electronic. Voltage, current and the power loss are measured in parallel and shown as amplitude values. Power is measured and displayed in real-time as well. Voltage and current are measured as real effective values and than displayed as amplitude values. The bandwidth of the measurement system is 10 MHz. This ensures that even with distorted signals the power loss is correctly captured. Small to mid-sized ferrites with an Ae up to approximately 400mm2 at 100 kHz with 100mT modulation can be measured with the BVM20. The measurement range can be extended with optional adaptors to test and measure larger core geometries. Besides displaying all values on the internal display, external displaying and evaluation of all values on a PC is available with the optional USB interface. External control of the device via USB is available as well. Both options are not implemented yet, but are intended to be in the near future. Success through energy and drive!